Over the past several months I’ve given a lot of thought to the idea of an author platform. As I wrote about over at Trouble the Write Way, an author platform comprises many things: your existing books and audience, your qualifications, your personal connections (especially in the publishing industry), and your online presence. For most of us, the core element of the online presence is an author website. While I don’t claim to be an expert in marketing or self promotion, I have a background in web design. I currently operate 7 independent websites that collectively saw over a million pageviews last year. That experience, combined with what I learned from some excellent articles on the topic (listed at the end of this article), have inspired this post: 8 things every author website needs. You have a few options for establishing your author website. You can create one for free at sites like WordPress, Blogger, and Wix, and if you’re new to such things, this might be the best way to start. All things being equal, I’d recommend WordPress, as it’s the most widely used website and blogging platform. Your domain will be something like authorname.wordpress.com, and everything you’ll need to create your website is ready to go. 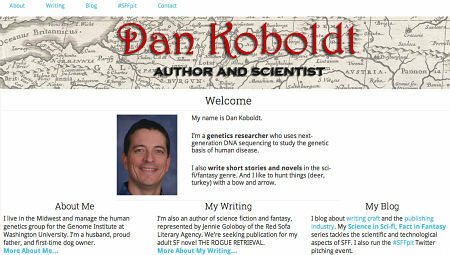 Many authors (myself included) set up their own website, which is a little more work but offers more control. To do this, you need to set up two things: a domain name (i.e. your URL), and a web host to make your files visible on the internet. Together, these will cost you $50-100 per year. I host my sites with GoDaddy — they have competitive prices and good support — but there are countless options. It takes a day or two to set up, and then you’ll want to install a local copy of WordPress to manage the website content. No matter which way you go, you should give this some careful thought. This URL will be the first thing that many visitors know about you – it’ll be in your e-mail signature, your Twitter profile, everything. First impressions are everything, and the appearance of your web site says a lot about you. If it’s clunky, crowded, or woefully out of date, that reflects poorly on you. Take some time to browse the hundreds of freely available design templates, and then personalize yours with images, text, colors, etc. It’s very easy — and also very tempting — to deck your website out with widgets and boxes and blogrolls and all of the things that WordPress makes so easy to do (especially in the sidebar). But this is a case where less is more. A clean, non-distracting website directs your visitors to the four or five places that you really want them to go. The idea is to let your visitors focus on what’s important: your about page, writing, and blog. You don’t need 16 widgets, 200 links, a calendar, and all of that. And please, for the love of God, remove the “Meta” widget from the sidebar. You don’t need it. An author bio. Reporters, bloggers, and others will thank you for making this readily available. Shoot for around 200-250 words, but it’s okay to have a longer version, too. An author photo. You’d be surprise how often people will need this for guest posts, book blurbs, etc. It should be full-color, recent, and (ideally) professional-looking. You know, like a headshot. A bit of personality. People reading this page want to get to know you. Not the dry official stuff, but things like your family and pets and how you came to be a writer. If you want a great example, check out Derek Halpern’s About page at Social Triggers. It’s catchy, well-organized, and engaging. This is an author website, and the main thing you want to tell an audience about is your writing. Obviously, if you have books out, you’ll want to have the cover, genre, publication date, genre, and blurb. Testimonials are good, too. Be sure to offer some links for buying the book, too. If you don’t have a book yet, that’s perfectly fine, but you should still have some information about what kind of fiction you write, your current work-in-project, etc. On my writing page, for example, I have sections detailing my novels, my short stories, and how I’m involved in the writing community. Your e-mail address, or a contact form that will e-mail you. It’s best to provide both. Some people seem to prefer one or the other. A telephone number, if you’re comfortable with that. You can get a free number from Google Voice that will forward to your real phone while keeping it private. You can turn it off at any time. Links to your social media profiles: Twitter, Google+, Facebook, etc. Give the visitors a few different options for getting in touch, so that they can do so the way they prefer. In my experience, visitors are least likely to call you, and far more likely to follow you on social media. E-mail is somewhere in the middle. The mailing list is an essential component of author profile-building and book promotion. Basically, it’s your way to collect the contact information of, and build relationships with, people who might buy your books. Ask anyone who works in internet marketing, and they’ll tell you that opt-in mailing lists have the highest conversion rate of any online sales tool. Much higher than Twitter or Facebook. The rub, of course, is that mailing lists are slow to build, just as they take time and effort to maintain. Unless you’re very tech-savvy, I’d recommend that you start your mailing list with MailChimp. It’s probably the most widely used tool for mailing lists, and it’s free until you reach a certain threshold (2,000 subscribers). MailChimp handles all the tedious tasks of registering/confirming users, sending out your newsletters, letting people unsubscribe, etc. If you want an in-depth guide on this topic, see my article on How to Build an Author Mailing List. Once you have a mailing list, you need to tell people about it and make it easy to join. This is one thing I’ll let you have in your sidebar (it’s THAT important), and you should encourage people to join it after every awesome blog post. Which leads me to the next point. All of the pages we’ve talked about so far — your about/bio section, your writing page — is a static page on your website. In other words, it’s a permanent page that you probably link to in the navigation bar or sidebar, because you’ll have few of these (and all of them are important). Unless you’re already a famous author, you won’t draw a lot of traffic from these pages alone. You’ll will need to produce actual content if you want to keep people coming back. In other words, you need to write new stuff on a regular basis. This should be easy. You’re a writer, aren’t you? A blog is the best way to accommodate new content on a regular basis, and it can be easily integrated with your website. If you use WordPress, the blog portion is simply a series of “Posts,” which differ from Pages because you’ll have many more of them. You won’t link to every single one in your navigation bar, but you can organize them by categories, or let visitors browse your entire blog archive. As for the content of the blog, I leave that up to you. Share your thoughts, show your personality, and allow people to get to know you. Be interesting. As your website gains status, you can also build up goodwill with other authors by hosting guest posts and cover reveals and interviews on your blog. Creating a web series — as I have done with the Science in Sci-fi, Fact in Fantasy series — is also a good way to generate regular content. Put the URL everywhere. There are many places to share the URL of your author website: In your e-mail signature, on your business card, and on everything you publish (including forum posts and web comments). Almost every social media profile has a spot for your website URL, too. Make sure you promote it far and wide, so people know that hey, this is you. Develop and share valuable content. Members of the writing community are always looking for good articles on writing craft, genre fiction, the publishing industry, etc. If you write good articles, you can share them on social media. Other people will share, if the content is good. This can bring you a lot of traffic, especially over time. Build partnership with other authors. One of the best ways to build the traffic to your author website is to network with and reach out to other authors & bloggers. Link to them. Write and host guest posts. This goodwill eventually yields a return, in the form of links and traffic to your site. Over the last few years, I’ve had the opportunity to meet many aspiring authors. Most of the time, I meet them online — either on Twitter or through the blogosphere — and if they have a website, I usually check it out. Here are some of the articles that I used when planning and writing this article — all good resources on the topic of author website design. How to make your own killer author website by Jessica Khoury of Authorial Intent. 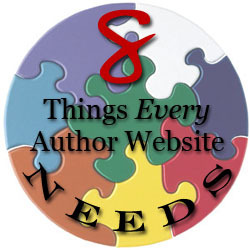 11 author website must-have elements over at Your Writer Platform. Build the ultimate author website in 1 hour by Tim Grahl at Out:think. Platform Pick-up series by Sarah Negetovich, literary agent and author. Now, go forth and build that awesome author website!